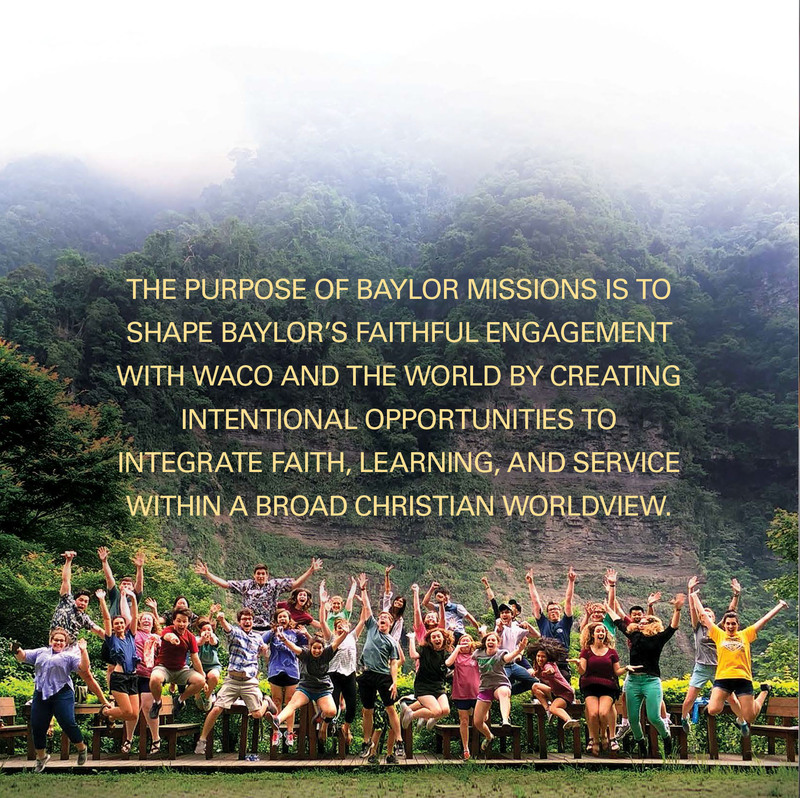 The purpose of Baylor Missions is to shape Baylor's faithful engagement with Waco and the world by creating intentional opportunities to integrate faith, learning, and service within a broad Christian worldview. As part of the Office of Spiritual Life at Baylor University, Our Mission is to nurture theological depth, spiritual wholeness, and missional living in the students, staff, and faculty at Baylor University by offering integrated formational programming, transformative missional experiences, competent pastoral care, and worship that is responsive to the Christian Tradition and sensitive to the culture. Global Missions collaborates with faculty & staff from a variety of disciplines & backgrounds along with our global partners in order to implement spiritually rich & challenging experiences for our students. It is our hope that the students who participate in our trips not only enjoy the experience (which is important), but also discover a sense of vocation & calling as they see first-hand how they can use their discipline to serve. partners with Waco organizations and churches to provide opportunities for students to engage in the greater Waco community through relationship building and service. We focus primarily on a discipline-specific approach to missions as it helps our students understand how they can use their specific strengths & passions in service of Christ & the world. We work in relationship with global partners, those individuals or organizations in country that help lead the way to meet the needs of their community. We will commit 3-5 years of sending Baylor teams to a specific location and to address a particular issue specific to that community (i.e. an engineering team that builds a hydro-generator in Honduras or a social work team that focuses on anti-human trafficking efforts). We believe it is our responsibility to insure that all students have an outlet for reflection on their experience. It is our hope that through this reflection process, we are helping our students integrate this experience into their daily lives. To understand the nature of the Missio Dei (the mission of God) & how they can participate in this through global mission projects. To have a greater understanding of what it means to use one's vocation & calling to impact the world for Christ. To understand that we have a responsibility to love & care for our community & global neighbors. To gain a healthy respect for local ministers & their ability to enculturate the gospel & minister within their community. To reflect & integrate their experience on the trip so that they can better understand the holistic nature of missions. To share their story, both at Baylor & in the community, that others might learn & be transformed by this experience as well.